Goalkeeper Keiren Westwood is a vocal presence in the Owls defensive unit but it’s what makes him one of the best shot stoppers in the league according to Michael Hector. Westwood gave another impressive performance between the sticks in the weekend’s defeat to Leeds United, with his save from Tyler Roberts lauded as one of the best of the season so far. The 34-year-old tipped over from the Leeds man’s point blank range header to keep Wednesday in the game in the first half, but was unable to prevent Jack Harrison from scoring the winner in the second 45. 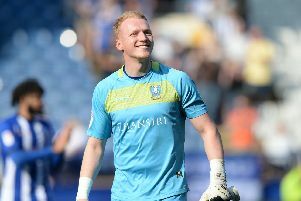 And Westwood, who is out of contract at Hillsborough at the end of the season, has been praised by his team mates for his recent showings after also making vital saves in recent matches against Nottingham Forest, Aston Villa and Stoke City. The Republic of Ireland international’s return to the Owls starting team has come in conjunction with a marked improvement in defensive performances since the new year, as Wednesday notched their 11th clean sheet of 2019 in last week’s 3-0 win over Nottingham Forest. And according to Owls loan man Hector, who has made 37 appearances in all competitions this season, Westwood’s vocal presence is one of the best aspects of his game. Speaking to BBC Radio Sheffield about Wednesday’s improved defensive performances, Hector said: “We’ve been like that for the last few months now, we have defended really well as a team. There’s a few players who have been playing really well. “We have kept the same faces at the back, a few injuries have happened of late but this back five defended really well and those in front of us have been more willing to defend as well and that has been a big help to us. “Obviously Westy at the back - he’s annoying at times but it’s good to play with a ‘keeper like that behind you. “Sometimes the game is not even going on and he’s still shouting at me! He’s an experienced ‘keeper in the Championship and he’s one of the best. “He’s one of those where he’s going to give an earful no matter what so it’s good. “He’s done it for a number of years now and we are very experienced at the back to be fair. Westwood is yet to be offered a new deal with the S6 club and has recently been linked with a summer move to Yorkshire rivals Huddersfield Town. But for now all focus for Steve Bruce’s men is on the remainder of the Championship campaign, with just four games remaining for Wednesday to see if they can reach the play-offs. With the gap to the top six now at six points, Good Friday’s clash against top of the table Norwich City is a must win if the Owls are to have anything to play for before the end of the campaign. “The Championship - you never know. Anything can happen, there are teams fighting for their lives at the bottom, teams trying to get promoted and teams like us trying to get in,” Hector said. “Until it’s not possible we are going to keep fighting and keep plugging away.